The ruins of an early 12th century chapel erected by Bishop Herbert de Losinga to serve his manor. It stands on the site of a pre-Conquest timber cathedral and cemetery. The chapel was incorporated into a fortified manor by Bishop Hugh Despenser in 1388, with a moat, curtain wall and inner and outer bailey earthworks, and the remains of the two phases of building are intermingled. Bishop's chapel ruins, on the site of a pre-Conquest timber cathedral. The chapel was converted into a fortified manor house by Despencer in 1388, with contemporaneous moat and inner and outer bailey earthworks. See (S1) and scheduling notification. 1786. Late Saxon censer found by the landlord of the adjoining inn, perhaps during the filling of the south moat. A. Cattermole (NLA), 4 January 2008. Much of the accumulated material within the buildings was removed, along with parts of the clay banks added by Despenser. The excavator did not recognise the walls as pre-Conquest, or, in spite of the burials exposed, that it was a church. They noted a furnace containing slag in the nave of the church, human bones in several positions and small finds including thimbles, pottery, floor-tiles, window-glass (including a piece showing a mitre) and deer-tines, mostly from Despenser's deep pits, particularly that just to the east of the tower arch. These excavations revealed evidence of earlier timber structures beneath the stone church. The complete absence of Middle Saxon pottery suggests that it is unlikely that the building pre-dates the late ninth century. Evidence for a series of floors beneath the stone church show that the timber building was gradually enlarged. The excavator suggested that the first phase of the stone church dates from the 1020s or 1030s and that further work continued throughout the eleventh century. See (S7) for short summary. Section of medieval curtain wall to the northeast. 'Roman' tiles in building are probably that, though not necessarily so. R.R. Clarke's reference to a possible motte and bailey site could be correct if referring to the whole (unfinished) earthwork layout, and not just the outer ditch marked by the Ordnance Survey at Tower Hills. Ruins in excellent condition. E. Rose (NAU), 23 November 1978. 1982. Re-assessment of architectural remains. A Norman date is proposed for the whole building, on the basis of its architectural features and the construction techniques which have been employed. The proposed Norman date does not deny the possibility that the site was indeed that of the cathedral. The design of the building is without parallel in any English or French stylistic context. It remains to be determined which bishop might have been responsible for the construction of the church. 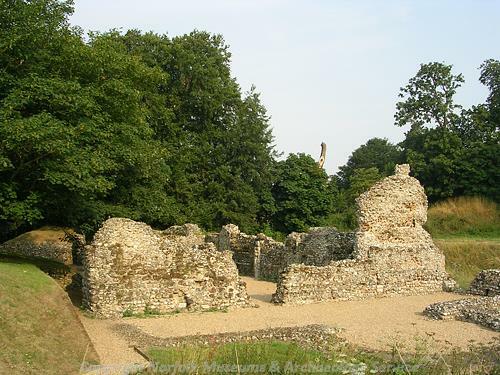 Analysis revealed that a post-Conquest date is most acceptable, and taken in conjunction with the documentary reference to the cathedral as a timber chapel, the transfer of the see to Thetford in 1071 provides a suitable terminus post quem. The building's hitherto enigmatic design can now be seen as that of an episcopal chapel. A. Cattermole (NLA), 7 January 2008. Aerial photograph (S4) shows that the mound in the northeast corner site is detached from Guardianship area, and marked by the Ordnance Survey as Tower Hills, formerly extended as mound and ditch as far as the bend in the road. E. Rose (NAU), 11 March 1985. Medieval pottery and ring found. A. Gregory (NAU), 3 March 1988. 1989. Stray find in molehill within ruins. W. Milligan (NCM), 31 August 1989. D. Gurney (NLA), 23 December 1994. The major earthwork is the almost complete moat which comprises the inner court of the manor house complex, the southern arm being partially destroyed by garden landscaping. Within the south-west corner of this is the moated enclosure which houses the manor house. Other significant features internal to the larger enclosure are an irregular mound in the north-west corner, thought to be a prospect mound, party of a building outline and a capped well. A. Cattermole (NLA), 8 January 2008. February 1997. Evaluation and watching brief, St George's House. See file for full details, plans, correspondence, photographs, scheduling documents and further references. --- Aerial Photograph: TF9821 A,ABD-ABM,ACE-ACG,ACH-ACR,ACT-ACV; OS 72.300.192. --- Article in serial: Green, C., Rigold, S. E. and Clarke, R. R. 1954. Other Archaeological Excavations 1953. Norfolk Research Committee Bulletin. Series 1 No 6 (for 1953) pp 2-4. p 3. --- Newspaper Article: Eastern Daily Press. 1954. No place on his grand piano for this skull.. 2 October. --- Publication: Dereham and Fakenham Times. 1990. Cathedral site controversy.. 17 August. --- Newspaper Article: Eastern Daily Press. 1991. Cathedral opens every day.. 18 October. --- Publication: Rigold, S.E.. 1960. North Elmham Saxon Cathedral, Norfolk..
--- Newspaper Article: East Anglian Magazine. 1956. Saxon Stones at North Elmham.. September Issue. --- Newspaper Article: Dereham and Fakenham Times. 1969. WEA party visit excavations.. 3 October. --- Newspaper Article: Eastern Daily Press. 1967. Anglo-Saxon well found at North Elmham.. 14 September. --- Photograph: Photograph of the Episcopal chapel and fortified manor house on site of Saxon cathedral, North Elmham. Colour. --- Article in serial: Rigold, S. and Heywood, S. 1980. North Elmham Cathedral. Archaeological Journal. Vol 137 pp 327-329. --- Archive: Clarke, R. R. and NCM Staff. 1933-1973. Norwich Castle Museum Record Card - Roman. Elmham [North] . --- Archive: Clarke, R. R. and NCM Staff. 1933-1973. Norwich Castle Museum Record Card - Early Saxon. Elmham (North). --- Archive: Clarke, R. R. and NCM Staff. 1933-1973. Norwich Castle Museum Record Card - Late Saxon. Elmham (North) . --- Archive: Clarke, R. R. and NCM Staff. 1933-1973. Norwich Castle Museum Record Card - Medieval. Elmham (North) . <S1> Article in serial: Rigold, S. E. 1964. The Anglian Cathedral of North Elmham, Norfolk. Analysis and excavation by the Ancient Monuments Branch of the Ministry of Public Building and Works. Medieval Archaeology. Vol VI-VII (for 1962 and 1963) pp 67-108. <S2> Unpublished document: Heywood, S.. 1998. The Site of the Anglo-Saxon Cathedral and the Bishop's Chapel at North Elmham..
<S3> Article in serial: Heywood, S.. 1982. The Ruined Church at North Elmham.. Journal of the British Archaeological Association. Vol CXXXV, pp 1-10. <S4> Aerial Photograph: NHER TF 7121ABM-N.
<S5> Monograph: Cushion, B. and Davison, A.. 2003. Earthworks of Norfolk.. East Anglian Archaeology. Vol 104. p 119. <S6> Unpublished document: Forrest K.. 1997. NAU Report No. 235. Results of an evaluation and Watching Brief at St George's House, North Elmham, Norfolk..
<S7> Article in serial: Wilson, D. M. and Hurst, J. G. 1958. Medieval Britain in 1956. Medieval Archaeology. Vol I (for 1957) pp 147-171. pp 154-155.